Everton boss Marco Silva says the returns of Barcelona summer recruits Yerry Mina and Andre Gomes have given him a "good headache". The Toffees host Crystal Palace on Sunday - live on Sky Sports Premier League - and Silva says the pair could make their first appearances with Mina, Gomes and James McCarthy returning from their respective injuries. Mina, who arrived for £27.2m in the summer, and Gomes, on a season-long loan from Barcelona, are yet to make their Premier League debuts for the club while McCarthy has been out of action since suffering a double leg break in January. "It is possible [they may be involved on Sunday]," Silva said. "Andre is working hard as well. Mina the same situation and James as well, but like you know, the injury to James is a little bit different. But he is working hard. "Of course [it has been frustrating]. Not just those three. Of course, for me as a coach, it's better when you have all players available to play to work with strong competition between them to achieve what you want. "It's a good headache to decide the squad on Sunday and the starting eleven." Everton have improved over the last few weeks, with Michael Keane and Kurt Zouma impressing in the centre of defence, and when asked about the pair's good form, Silva said: "Yes, I agree with you. "But this is what I want, competition, and I have to take the decision. "[Keane and Zouma] are doing well, we are being more solid in the last games as well as a team, not just the two central defenders, but as a team." 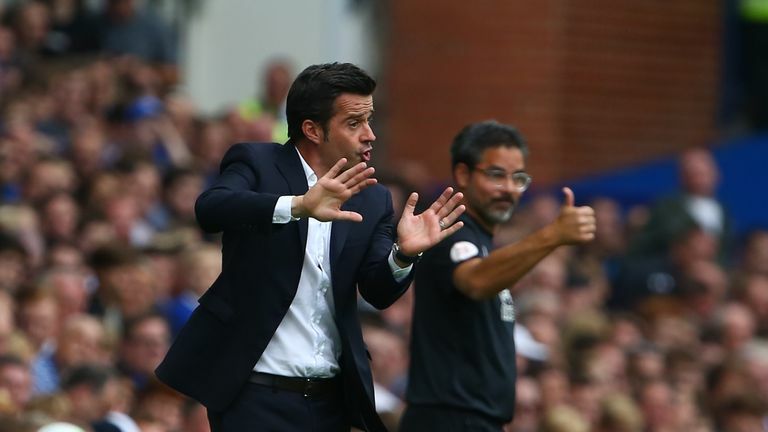 Silva also confirmed that Everton are starting to look ahead to the January transfer window. The 41-year-old Portuguese says he has held positive talks with director of football Marcel Brands, but stressed that he is happy with his current squad. "It's something of course, we are doing our work," he added. "We have monthly meetings with the board. He [Brands] knows my idea. "But really our focus is to work with our squad now. Just now, in the last few days, I'm starting to enjoy working with all of them. "It's important we take care of them, to gel everything in the right way, we have many things to improve. I think our future will be good."